Jim L. Ridling, a native Arkansan who has lived and worked in Montgomery since 1987, was appointed Insurance Commissioner by Governor Bob Riley in 2008. Commissioner Ridling was reappointed by Governor Robert Bentley in 2011, and reappointed by Governor Kay Ivey in 2017. Ridling is a graduate of the University of the Ozarks. Upon graduation, he entered a management training program with Fireman’s Fund Insurance, leading to several management positions and culminating in his service as Executive Vice President U. S. operations, based in California. In 1987, he left California to come back to his native South. He traded his interest in American Express (which owned Fireman’s Fund at the time) for ownership in Southern Guaranty, a Fireman’s Fund subsidiary headquartered in Montgomery, where he served as the company’s President and Chief Executive Officer. The following year, Southern Guaranty sold to Winterthur Swiss, and he remained in his previous role and added the duties of Chairman until his retirement on December 31, 2003. 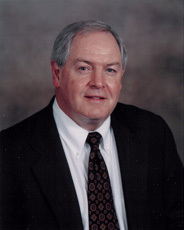 Following his retirement from Southern Guaranty, Commissioner Ridling remained active. He and other local business leaders formed River Bank and Trust, where he currently serves on the Board of Directors. Commissioner Ridling is a former Chairman of the Board of Directors for Jackson Hospital and has served on the Boards of Directors of the Montgomery Airport Authority, the Montgomery Area Chamber of Commerce and the Central Alabama Community Foundation. He is a former Chairman of the River Region United Way and continues to be involved in local business, charitable and community activities. He is married to the former Catherine Turner, a native of Northern California. He has two daughters – Erin Ridling and the late Hannah Ridling.